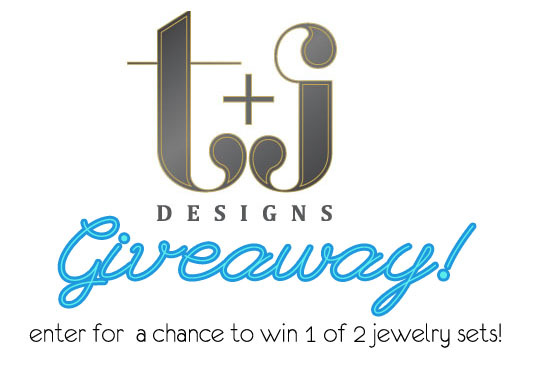 t+j Designs Blog: t+j Designs Giveaway! First, thank you so so much to those of you who have been so supportive during our launch. I know a lot of you are getting your orders and thank you so much for the feedback! We are extremely happy you guys are loving your pieces. And some good news! Due to the popularity of the 20% discount code (use code FRIENDS at checkout) we are extending it until tomorrow (8/23) so if you have your eye on a piece, take advantage of the code and order now! Now, onto some really fun stuff! To celebrate the launch of t+j Designs, we wanted to hold a giveaway to give you all a chance to win some of our favorite pieces from our line! We have two amazing sets to choose from! The first is our Luxe collection and one lucky winner will receive our Gunmetal Braided Necklace, Gold and Black Twisted Hoop Earrings, and Silver Sparkly Knuckle Ring (this ring is adjustable so should fit most fingers). Prize is worth approx. $170! 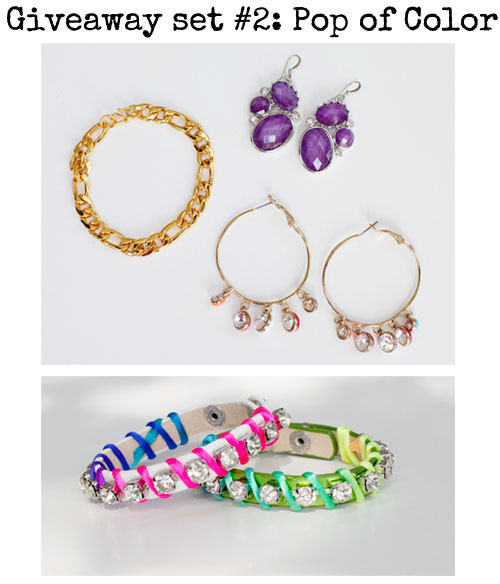 The second is our Pop of Color prize pack and contains, Silver and Purple Dangle Earrings, Dangle Stone Hoop Earrings, the Gold Chain Bracelet and 2 faux leather, ribbon wrapped bracelets that are yet to be released (look for them on the website soon!),. Prize is worth approx. $145! 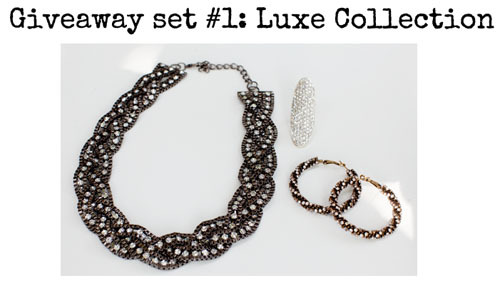 Tweet this: "I just entered to win fabulous jewelry from @tplusjdesigns! http://bit.ly/obuiGw"
if you've already blogged about us previously, you can count that as an entry! I know it's a lot but I wanted to give you guys options! :) Do one or do all, it's up to you! After you've completed the entries, please fill out this form to be entered. All info will be kept confidential and not shared with anyone else. How we will pick the winners: We will gather the people with the MOST entries (4 entries or more) to do a random draw. The winner within that group will get 1st pick of the giveaway sets. The second giveaway set will be a random draw amongst ALL the entries. Winner will be chosen by random draw (see specifics above) and notified by email and announced on our blogs on a later post. Oooo I just entered!! I'm so excited.. crossing my fingers and toes... :D I did everything, but tweet, because I don't tweet. hee hee.